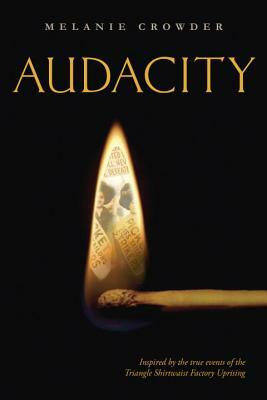 A gorgeously told novel in verse written with intimacy and power, Audacity is inspired by the real-life story of Clara Lemlich, a spirited young woman who emigrated from Russia to New York at the turn of the twentieth century and fought tenaciously for equal rights. Bucking the norms of both her traditional Jewish family and societal conventions, Clara refuses to accept substandard working conditions in the factories on Manhattan's Lower East Side. For years, Clara devotes herself to the labor fight, speaking up for those who suffer in silence. In time, Clara convinces the women in the factories to strike, organize, and unionize, culminating in the famous Uprising of the 20,000. Melanie Crowder (www.melaniecrowder.net) lives on the Colorado Front Range where she is a writer and educator. She teaches English to non-native-English-speaking students at her local school and holds an MFA in Writing from Vermont College of Fine Arts. Follow Melanie on Twitter at @MelanieACrowder.